India is set to surpass China in a few years as the country with the highest population. While it also remains one of the fastest-growing economies in the world, it is struggling to reduce the income inequality. 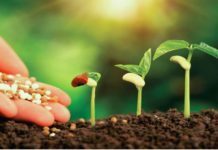 This is due to the country’s difficulty in getting a young workforce to drive economic activities; and the entire situation circles back to the basics – lack of quality education, basic amenities and a skilled workforce to steer this growth. Slowly yet steadily, India’s leading passenger vehicle manufacturer, Maruti Suzuki, has been identifying these gaps and is providing solutions for a holistic development of the society and bridging the economic disparity by making the youth, especially in the rural and tribal areas, job-ready. To have a more streamlined approach, the Company has broadly categorised the social initiatives into three areas – Skill Development, Community Development and Road Safety. With employment as the main focus, we strive to offer India’s youth the skills relevant to industry requirement through our Skill Development, a pan-India initiative. Currently, the automobile industry contributes around 7.1 percent to India’s GDP, and we at Maruti Suzuki believe that the industry can produce 6.5 crore jobs by 2026. As of 31st March, 2017, we have worked in partnership with over 140 Government ITIs across 27 States to offer vocational training to the youth through a curriculum that is designed to address the skill gap existing in the industry. For this, the students are given exposure to latest technology and industry environment. With automobile technology constantly evolving, we are continuously upgrading training models to impart new learnings and skill sets. To meet the needs of this dynamicity, we have set up Automobile Skill Enhancement Centres (ASEC) at 60 ITIs. Each of these centre is equipped with a model workshop on which practical training is imparted by full-time trainers provided by the Company. 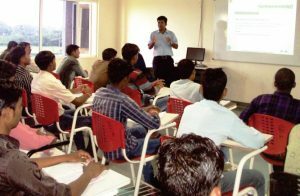 Over 6000 students have been trained and 50 percent have been absorbed by the Maruti Suzuki dealer service network. A big surprise awaited 17 year old Shubham Maurya the day he walked into Pusa ITI’s automobile trade course section. 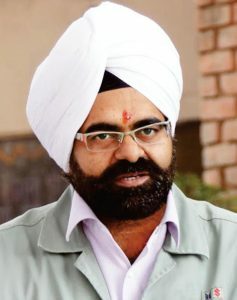 Having visited two ITIs where his friends were studying to get course information, he did not know what a company-supported ITI meant till he enrolled here. It was only when he completed his first week of theory and practicals that he realised the edge he had over his contemporaries elsewhere. A meticulous curriculum with relevant lesson plans was backed by demos in the workshop where state-of-the-art equipment and guidance by trained faculty on the latest car models and spare parts, ensured every student got ample time to practice. Ongoing sessions on soft skills, how to sit for job interviews and trainings by organisations like HIDA from Japan, prepared him and his batch mates for the upcoming placement season. Additional time spent in company dealer workshops provided relevant exposure to service, management and practical side of automobile repair and maintenance. We consider the local community as the direct stakeholder group and thus, we are devoted to the cause of improving their quality of life. Under this initiative, we provide must-have basic amenities to enhance the quality of life in villages. These include facilities like drinking water, roads, individual house hold toilets, community grounds, reconstruction of school infrastructure. We follow a holistic approach and undertake projects based on preliminary baseline surveys to address the sanitation issue in the villages. We facilitate construction of individual household toilets, laying of sewer lines along with solid and liquid waste management, among others, in these villages. We are undertaking development activities in 24 adopted villages across Gurgaon, Manesar, Rohtak (Haryana) and Hansalpur (Gujarat) to transform them into model villages. We work closely with the village Sarpanch and other key influencers to understand their needs and collaborate with them to plan and prioritise community development efforts. Till date, sewer lines have been laid in six villages, and 2,607 individual household toilets have been constructed in Manesar, Rohtak, Gujarat and Bangalore. “Imagine a newly-wedded bride being escorted to the fields by the groom; or a pregnant woman with her frequent need to urinate having to beg someone in the family to accompany her; or a woman who has just delivered a baby, braving the stitches and discomfort, dragging herself to what could be a half to one kilometre walk each way. Every day is an ordeal for these women. Many more girls and women in the village have their share of toilet stories to tell, till the time Maruti Suzuki came and constructed household toilets helping restore dignity and pride to these women,” says Rekha Devi, mother of a one year old in Bas Hariya village, Manesar, Haryana. Earlier this year, during one of their need-assessment analysis at Bas Hariya village in Manesar, availability of clean drinking water and sanitation was recognised as one of the biggest challenges faced by the residents of the village. 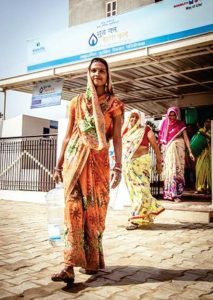 To bridge this gap, Maruti Suzuki partnered with WaterLife India to set up a Water ATM in the village. The Water ATM has the capacity to generate 1000 litres of pure water per hour. 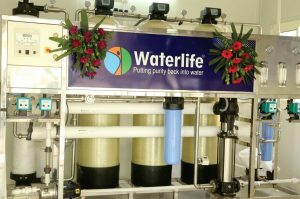 The 10 stage UV filtration technology by Waterlife ensures the water meets WHO and ISO 10500 standards and retains essential minerals. The technology also helps in minimal water rejection – only 1/4th of the conventional water purification facilities – making most of the input water consumable. This minimal wastage of water enables lower costs per litre. In total, the Company has setup five Water ATMs, and so far, around 10 lakh litres of water has been dispensed, benefitting over 8000 households. Recently, a delegation from the United Nations visited Bas Hariya village in Manesar to witness the CSR efforts undertaken by us. We remain deeply committed toimproving safety on Indian roads byimparting quality driving training andeducation. We have strategically reached out to key segments of societysince 2000 by providing skills,knowledge and attitudinal inputs toboth road users and road drivers. We are also empowering the tribal belt in Gujarat with All Gujarat Institute of Driving, Technical Training and Research (AGIDTTR). This was taken up in association with Ministry of Tribal Development (Gujarat) under the Vanbandhu Kalyan Yojana scheme in Waghodia, Vadodra in 2009. This area, on the eastern belt, has the largest concentrated tribal population in the State, forming 15 percent of Gujarat’s population. This first of its kind residential driving training camp focuses on tribal youth, between 18-32 years of age, to increase employability. Admission is free. The Institute has so far trained over 11,000 tribal youth in over 100 batches. It offers four types of courses: Light Motor Vehicle (LMV), LMV-Commercial, Heavy Motor Vehicle (HMV) and Forklift. The graduates are absorbed by top companies of the country like Vodafone, Lupin, JCB. 21 year old Jignesh Haresingh is from Waghodia Tehsil in Vadodara, Gujarat. He received Heavy Motor Vehicle (HMV) driving training at AGIDTTR. He now works in a supervisory role at a dealer outlet, with a monthly salary of Rs. 20,000. The training has helped him qualify the driving test and other formalities at Regional Transport Office before finding a job. He is one of the many boys trained at AGIDTTR who have blossomed into smart, successful young men, and an example to their community. “Lessons on simulated driving, English speaking, etiquette training and working in a corporate environment helped me get a job and excelling in it, keeping my employers happy,” says Jignesh, when asked about the impact the training has had on his life. 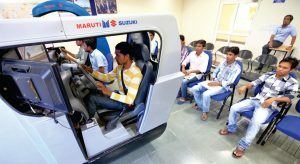 Maruti Suzuki is dedicated to educating the country’s youth about safe driving, and as part of the campaigns designed to bring a change in the mindsets, it has established the Institute of Driving and Traffic Research (IDTR) in partnership with various State governments. As of today, we have set up six IDTRs, including two in NCR and one each in Dehradun, Vadodara, Rohtak and Bahadurgarh. Through these IDTRs, we offer training to passenger and commercial vehicle drivers on scientifically designed driving tracks and simulators. 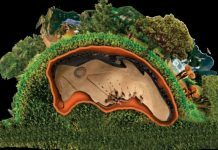 This year, the Institute introduced ARITRA Technology, a technology developed specifically for driving training. This camera-based image processing technology will help train 2,500 new car learners per annum at the Institute. It functions on motor vehicles fitted with cameras, Wi-Fi connectivity and underground fibre optic cables, which relays back to the control room, where the trainee’s driving action is tracked on a real time basis. The specially prepared algorithm register actions such as kerb hits, unscheduled stops, parking methodology and deviations from ideal path compliance. Accompanying the software is a mobile application that is used by the instructor to halt the training and play back the driving lesson to the learner to correct mistakes immediately. The application gives scope for review, discussion and going back to the formation through real time on the track while the control room data helps iron out undesired driving habits using data analytics. In FY 2016-17, we have spent a total of Rs. 89.45 crore on our various CSR programmes. We have set aside a total of Rs.140 crore towards CSR spending for FY 2017–18. This year, with an aim to holistically develop the communities benefitting through our initiatives, we have added health care under our CSR umbrella. With the number of works and beneficiaries growing every year in our focus areas like education, skills, road safety and healthcare, we at Maruti Suzuki, aim to create a positive impact in the overall well-being of the society.